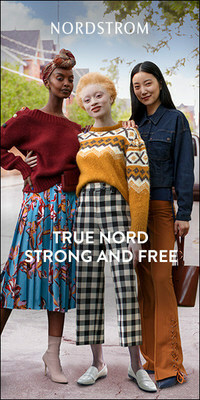 TORONTO, Aug. 27, 2018 /CNW/ -- Leading fashion retailer, Nordstrom, Inc. is pleased to announce the launch of 'True Nord,' its first-ever national Canadian marketing brand campaign, debuting August 27. Produced in partnership with Toronto-based advertising agency, Ogilvy, the campaign celebrates the inclusive and welcoming spirit of Canadians through the lens of individuality and personal style. The campaign is inspired by the phrase "True North" within the national anthem "O Canada," as 'Nord' means 'North' in French. The natural synergy influenced the anthem's role in the campaign along with key lyrics including "strong and free," "with glowing hearts," and "from far and wide" that highlight the shared values of Canadians and Nordstrom. "We've been proud to serve our Canadian customers since 2014," said Scott Meden, Chief Marketing Officer for Nordstrom. "We value the richness that diversity and culture bring to our communities, and our Canadian customers and employees set an example with their warm, welcoming and inclusive spirit. Our hope with this campaign is to celebrate all Canadians and the values we share and strive to reflect as a brand." "As we got to know the Nordstrom team and visited its stores, we realized how much Canadians and Nordstrom have in common," says Ogilvy Toronto CEO Laurie Young. "It is truly serendipitous that 'Nord' means 'North' in French." Mel Kobayashi, Founder, Bag and a Beret Blog; "As Canadians, I think we're compassionate and quirky. I love that we're not sure who we are, but we certainly know bone deep that we are Canadian and we know what that means without necessarily having to define it into words." Harjas Singh, Stylist and Consultant, Styled by Harj; "I'm always observing. I find fashion inspiration by being a people watcher. There are so many different people in Canada, doing many different things, while wearing their identity with so much pride every day. That's one of my biggest inspirations." Biko Beauttah, United Nations Goodwill Glambassador; "My favorite part of the Nordstrom Canada campaign was being so comfortable as a transgender woman. I often go into spaces and feel excluded, but this wasn't the case. It was just amazing. I feel like we created magic." Yolanda May Largie, Co-Founder, The Canadian Curvies; "My favorite thing about being a Canadian is the diversity. We're so different, yet so the same. Living in Canada, we get to kind of see all the different cultures and the different dynamics, and openly embrace other people, and their styles." The multi-channel campaign encompasses digital advertising, television commercials, YouTube, out of home (billboards, digital screens and transit shelters), social media and Nordstrom.ca site experience.